Vindictiv, formed and led by Swedish guitar sensation Stefan Lindholm, returns with another major platter of melodic metal, Ground Zero. Again Lindholm is joined by Pontus Larsson (k), Goran Edman (v), and Nalle Pahlsson (b), with addition of new drummer, Zoltan Csorsz. Also, Lindholm recruited Marc Boals and Oliver Hartmann as additional vocalists on several tracks. Expect more of the same from Vindictiv: well-crafted compositions of melodic progressive heavy metal and tag team virtuoso keyboard and guitar solos, all under girded by a definitive and steady rhythm section. Besides the addition of two other lead vocalists, you will also find the songs longer (most clocking in over 6 minutes) and some often heavier than their debut album. The heavier sound begins early with the first three songs. Generally, all three are fine songs and you will find some variation within each: 'In A Modern World' brings lots of movement, subtle piano work, and a symphonic foundation; on 'Ground Zero' the arrangement isn't as expansive, but the vocal arrangements are better; and, on 'Reach Out,' with Hartmann's first appearance, the sound is deeper and darker. Unfortunately, by this time you realize this thread of heaviness has become monotonous, pounding you mercilessly and unnecessarily. Thankfully, a reprieve is granted beginning with 'Golden Gate,' a more melodic piece with a sweet groove, excellent bass, and phenomenal vocal work. This less heavy trend continues through the remainder of the disc. With the exception of the desperately dull 'I'm Back Home,' the heavy feature appears as part of the composition rather than the formidable glue. Even better is the fact that the latter two-thirds of Ground Zero tends more towards the melodic and progressive side where 'Tweedledum and Tweedledee,' 'Overshoot Day,' and the epics 'Martha's Song' and 'No Matter' show impressive and pleasing results. Finally, and to my own surprise, I found the most disappointing songs to be those with Oliver Hartmann on vocals. With the exception of 'The Sacrifice,' Hartmann's voice made the songs bottom out. In the End, Vindictiv's Ground Zero is worthy sophomore effort and successor to last year's debut. Though sometimes heavier in parts, Vindictiv succeeds in merging melodic and intricate elements into excellent and entertaining progressive heavy metal arrangements. Very recommended! Vindictiv's Ground Zero is worthy sophomore effort and successor to last year's debut. 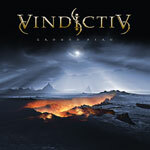 Though sometimes heavier in parts, Vindictiv succeeds in merging melodic and intricate elements into excellent and entertaining progressive heavy metal arrangements.